For most, the Nike Mercurial Superfly is the pinnacle of boot options; worn by Cristiano Ronaldo, the one we all want to own. But, that isn’t always possible, largely in part to the $300 price tag. Instead, it is the Mercurial Veloce III that stands to be the more realistic option, offering players similar style and performance to their top-tier brother. But what do they have to offer? And how do they actually compare to the CR7 specials? We’ve had the opportunity to test both, and here is what you’ll need to know about the Veloce III DF if you are considering a pair. Find the current Mercurial Veloce III DF line-up at soccer.com. 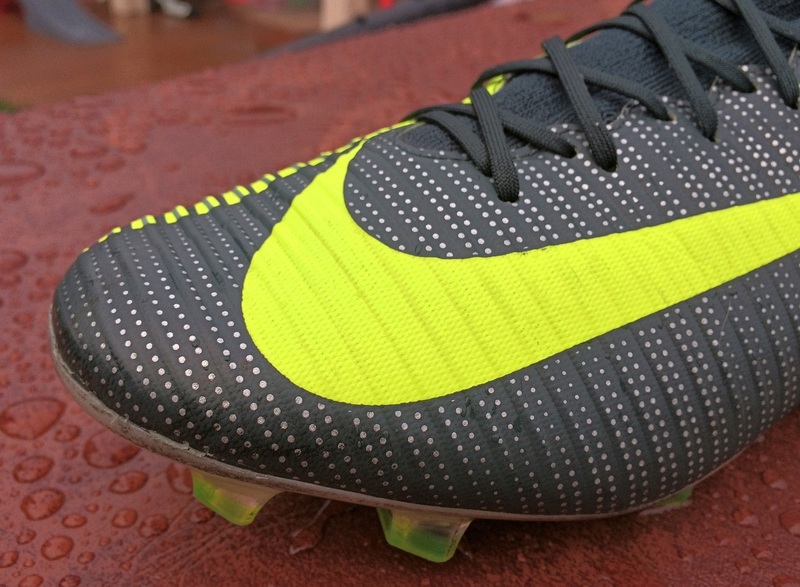 Something that Nike has been very good at over the past few years is developing mid-tier boots that fit very comfortably, even when it comes to the more tech advanced silos. This version I would label as more advanced, because of that dynamic mid-cut collar. 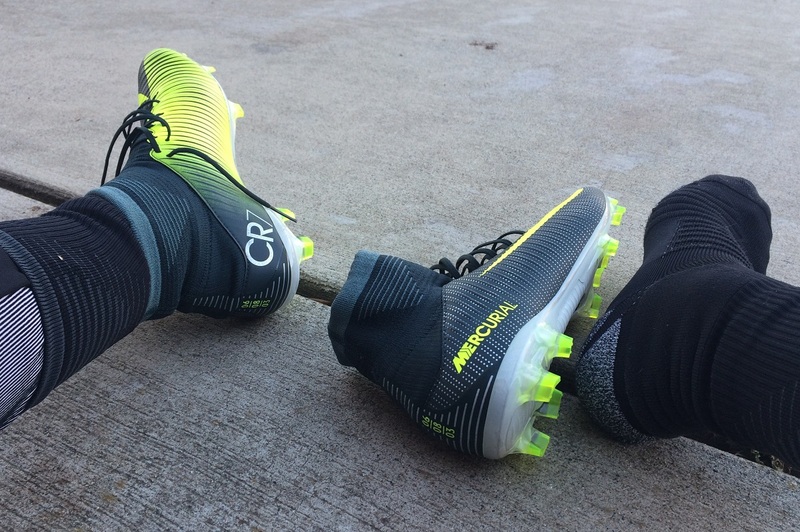 Out of the box, the soleplate has some decent flexibility, even with the Mercurial anatomical plate in play. On the Veloce, the new Mercurial anatomical plate has been toned down, with less undulation and added parts, but it is still aligned with the natural contours of the foot, “eliminating the gap that previously existed underfoot”. It has an area that is slightly thicker, build to work like a spine, and it does create some stiffness, but it starts to open up right from first wear. 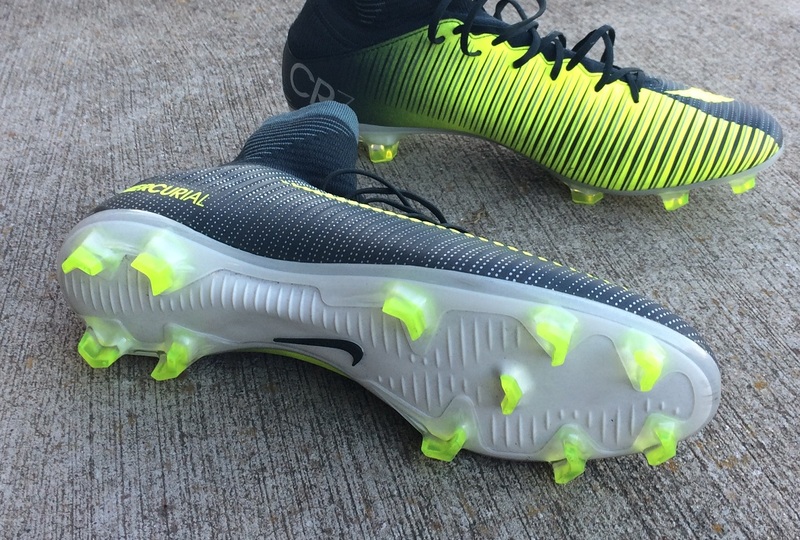 I noted in the Superfly review that the heel caused some issues, as the build felt a little too high. Thankfully, this is something I didn’t encounter with the Veloce, where there is more padding through the region. The upper is a synthetic material that features Speedrib texturing. It is an odd statement, but the synthetic feels very much like a synthetic. On other boots, the synthetic can have a leather like feel, but with the Veloce you won’t mistake the material in play. To the touch, it has a structured feel that is enhanced by the 3D Speedribs. What Nike is looking for here is more definition on the ball, with the ribbed material creating extra control. You will notice it most as you take close touches on the ball or look to play passes with a little added curve. Another nice aspect of the design is the fact the material is thicker around the strike zone, providing a little extra ping behind shots. You will really unjoy the connection, as you won’t have to soak in the entire impact across the top of your foot like you will on other speed boots. And even if it isn’t substantial, there is the bonus of a little added protection. I’ve talked a bit about the Mercurial anatomical plate above, but what is also important to note is that this version is more simplified than the version found on Superfly. What does that mean? In reality, the materials are not as tech focused and the break-in is easier. Nike has reduced the amount of undulation across the plate and this actually produces less strain on the design and that proves beneficial in play. I had issues with comfort on the Superfly, but thankfully not so much with the Veloce. That is a bonus point to the Veloce. The concept of the design still has the same focus; straightforward speed. 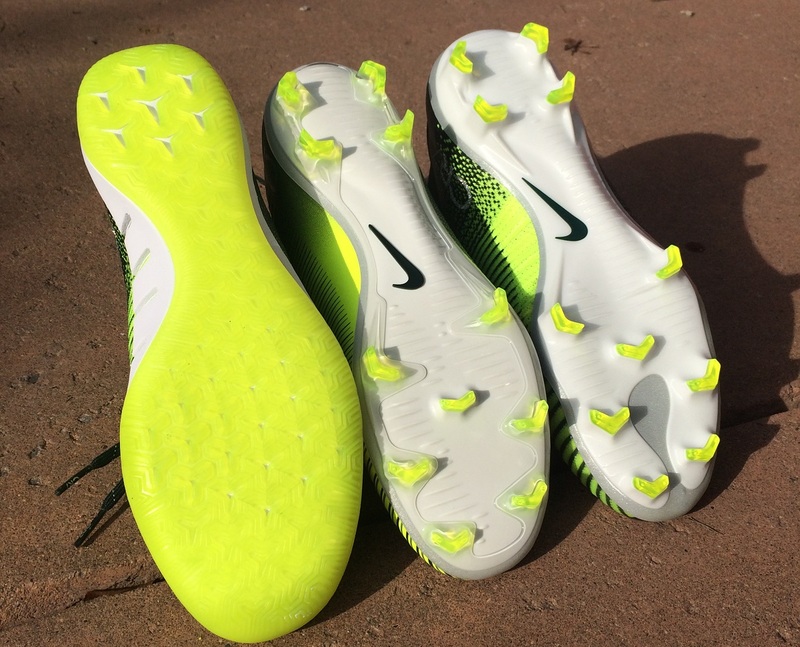 For the first time, Nike Football leveraged virtual Finite Element Analysis (FEA) testing, which provided scientific data to identify which traction pattern works best for the speed-focused player, inclusive of linear sprints. 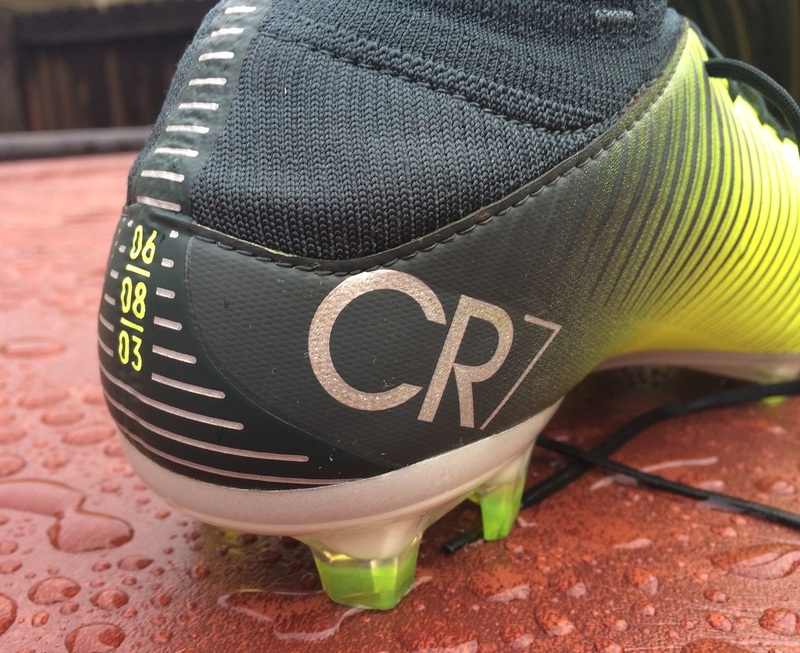 I’ve got to say that this testing has paid off as the actual traction provided is top-notch, providing a very similar type of traction found on CR7’s actual boot. You get great grip on FG and AG, with the ability to really dig into and release from both surfaces at top speed. I’ll always prefer low profile conical studs on turf surfaces, but the Chevron blades prove very useful. In typical Mercurial fashion, they are a best suited to players that enjoy narrow fitting boots. Through the midfoot, they don’t offer a lot of width and the general design is intended to be snug, so you won’t have much wiggle room once you get your foot in. I have a medium/wide foot, and they worked out well, although I wasn’t as comfortable as I normally would be in a true-to-size option. It is something I’ve come to adjust to while wearing boots from the Mercurial range! Length wise, they are as you’d expect and there is no reason to adjust size in this area. I’ve talked about the mid-collar in the past, and there is no concern with it being too tight to get your feet into the boots. A common misconception is that it is difficult to slip them on. But, after slipping them on for the second or third time you will be a natural. I’ve also found that the material doesn’t stretch much overtime, so it shouldn’t end up being loose around your ankle. So, you might be wondering why there are two versions of the Veloce currently available for each colorway; one with a normal cut ankle ($130) and the other with a mid-cut collar ($170). Nike has created a mid-tier option for both the Superfly ($300) and the Vapor ($200) series. The use of the term DF, which stands for “Dynamic Fit”, is what separates the naming convention of both boots. From a performance perspective it just comes down to that collar, and if you want it, you will need to spend an extra $40. 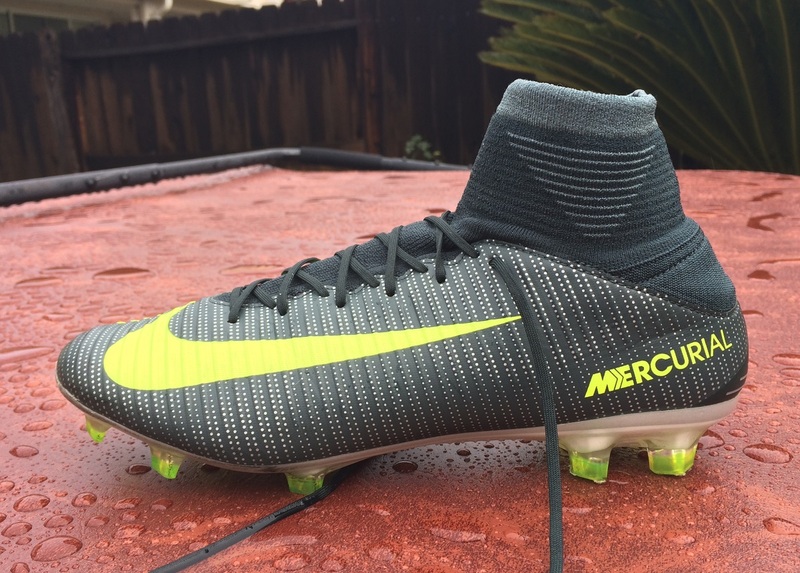 Visually, the Veloce ($170) is very similar to the Superfly ($300). From the dual upper colorway design, to the inclusion of a midcut collar, from a distance it is tough to distinguish which is which. The soleplate also has a similar white pattern, so unless you are inspecting them opposing players might not spot a difference. Performance wise, they are very different. The Veloce features a synthetic upper, while the Superfly includes textured Flyknit. But that is not discrediting the Veloce, they are just created in a slightly more simplistic fashion. What makes the Superfly different is the fact it will give you better performance and a more uniform fit over time. What is not to like about these boots? Through my time with them, I found little to complain about. They are comfortable, fully functional and players who desire a collar will enjoy what they have to offer. But, if I was comparing them to other boot options in the same price range, there are many others I would choose first. They are a solid boot, but what you get from wear one is what you get all through your time with them. I can just see money being spent more wisely on other options. I’m all about getting value for money and finding boots that work effectively without complications. While wearing the $300 Superfly, I encountered some issues with comfort and you need time to adjust to a pair. In reality, they won’t end up working out for some players, so why spend a few weeks figuring that out. With the Veloce III you are getting a boot at a decent price range that will let you know after a wear or two if they are the right boot. Everything about it is toned down, so even though they are not tech heavy they are reliable. If you want the same boot as CR7 and something that will morph performance wise as you wear them, go for the Superfly. But if you are on the fence and dependent on money, I’d give the Veloce a chance. In saying all that, if you are pairing them up against something like the adidas Gloro, you would have to go Gloro!!! The Mercurial Veloce III is available at soccer.com. Highlight: An inspired CR7 take down model that offers the same visuals as Chapter 3 in a more simplified fashion. A good boot to pick up if you want to experience the mid-cut collar without a big price tag. Weight: 6.7oz, so very much on par with the Superfly. Would I Buy Them: As a mid-tier option, yes. They do the business for what they are. Player Position: Obviously they have a focus on Speed, so wingers and any other player in the attacking side of the field will benefit. But, they are also nicely padded across the forefoot, so defenders can definitely take a look!